The Bose SoundWear are wireless around-the-neck companion speakers that will not be versatile enough for most use cases. They won't be the best option to use outdoors since they leak like speakers and do not isolate from ambient noise. However, they're a decent option for listening to music, podcast, and audiobooks at home or at the office. They also have excellent breathability and good comfort since they do not cover your ears. They will sound good enough for most listeners but lack quite a bit of bass due to their very open design. Tactile bass and unique soundstage. No isolation from ambient noise by design. Niche design with limited use cases. The Bose SoundWear have a unique design that puts them in a class of their own; companion Bluetooth speakers. 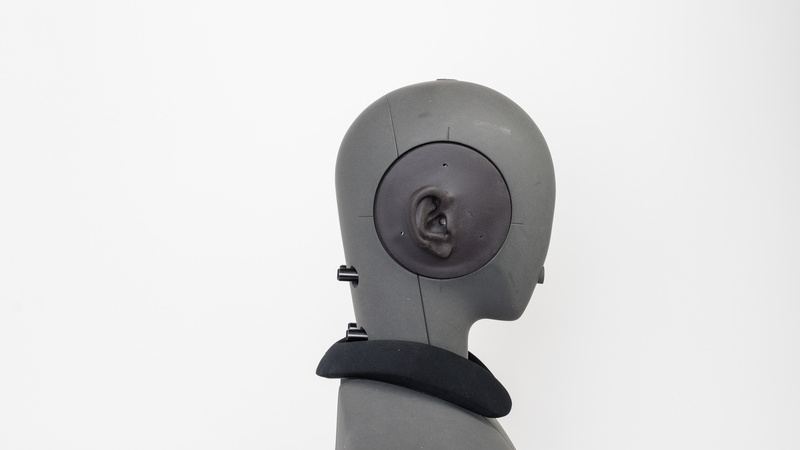 They are for personal use like headphones, but since they have no ear cups or buds, they are essentially speakers that you wear around your neck. This comes with a few advantages, like excellent breathability and great comfort since they do not cover or enter your ears. 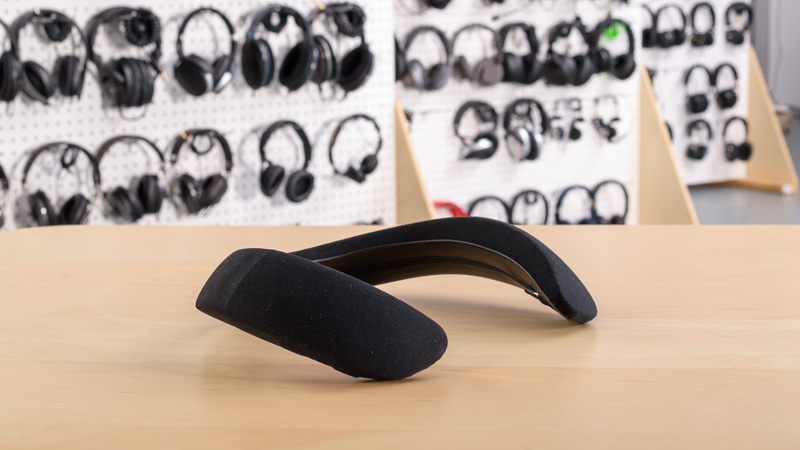 They're decently lightweight but not comparable to other neckband designs, so the slight pressure on your shoulders may get a bit tiring during longer listening sessions. They're stable enough for jogging on a treadmill at home or for a few selected workouts, but won't be the ideal option for sports since they bounce around a lot. On the upside, they look well-made and high-end, and the neckband is surprisingly flexible. The Bose SoundWear companion speaker have a unique around-the-neck design that blurs the line between a Bluetooth speaker and a personal listening device like a headphone. They have a large and dense neckband that's covered in a fabric sleeve, which comes in a couple of color variations. It's a very simple design that does not have built-in earbuds like some of the other neckband speaker available on the market. 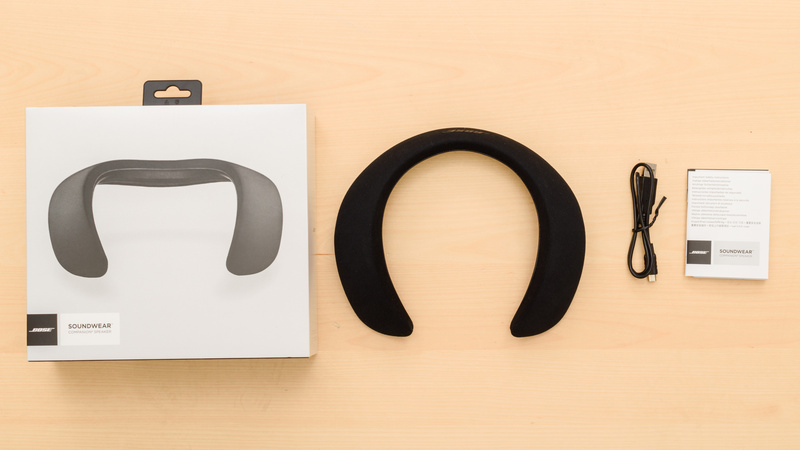 On the upside, they look great for wearing at home or at the office although they won't be the ideal option for outdoor use since the speakers will be bothersome to those around you even if they look cool around your neck. The Bose SoundWear are a comfortable neckband speaker design that will not put any pressure around, on, or in your ears since they're not really headphones. 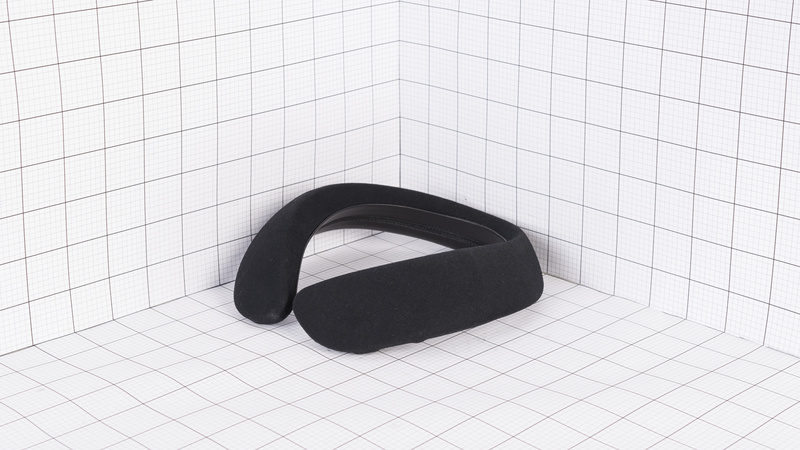 On the upside, the neckband is flexible, easy to wear and coated in a decent fabric that will not irritate your neck during longer listening sessions. They're a bit more lightweight than their size would suggest, although since there are no around-the-neck headphones with this weight, you will feel a slight pressure on your shoulders. For some, this might be an issue, especially when wearing them for a while but compared to most headphones, the SoundWear are more comfortable. The Bose SoundWear have a decent control scheme, very similar to most Bluetooth neckband headphones. 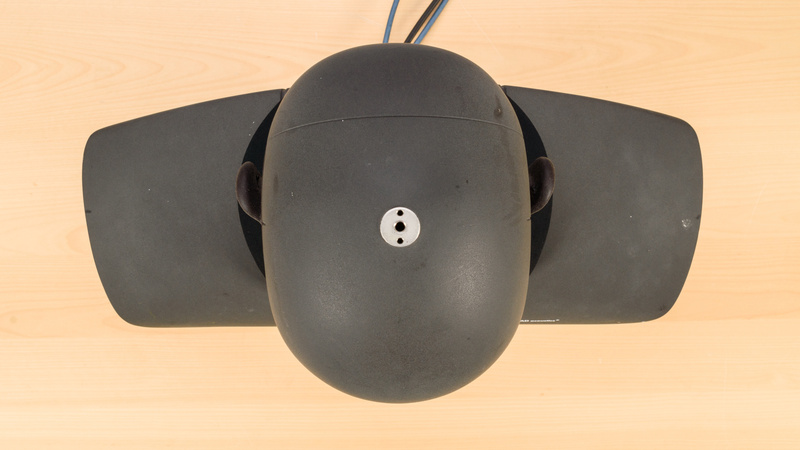 They provide a three button set up for call/music management, track-skipping, and volume controls. 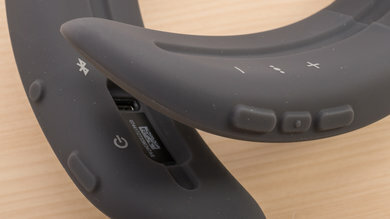 They also have a dedicated power switch and Bluetooth button to easily pair the headphones/speakers to new devices. The buttons are fairly clicky with above average feedback although the layout on the side of the neckband may take a bit of time to get used to. The Bose SoundWear Companion will not make your ears warm since they do not cover your ears. This means they have excellent breathability and will not make your ears sweat more than usual whether you're doing high-intensity exercises or wearing them the whole day. They will make your neck a bit warmer than typical around-the-neck earbuds since they have a bit more surface area. We do not yet account for this in our breathability test but overall the SoundWear will be breathable enough for most sports. Stability and portability would be a bigger issue for that use case. The neckband design is fairly large and a bit cumbersome but decently portable enough that you can carry them around your neck for most use cases. They won't be the most suitable device for outdoor use since they're basically speakers, but in terms of portability, they are slightly more practical than some over-ear headphones especially gaming headsets. Unfortunately, since they're mostly made for indoor use, they do not come with carrying case or pouch. The Bose SoundWear do not come with a case and or pouch. The Bose SoundWear have a great build quality that feels durable, but you may have to buy a new fabric sleeve after a while. The neckband design is very flexible yet made with a dense plastic that's sturdy enough to handle multiple drops. The buttons are clicky and responsive, and even the speaker grills, vents, and rubber-line coating on the neckband feels well-crafted and high-end. The sleeve is also well-made although it will get damaged over time by regular wear and tear more easily than the rest of the design. On the upside, they are sold separately on the Bose website so you can always buy a new set. The neckband design of the SoundWear makes them stable enough to run with but are not the ideal headphones/speakers for sports. They will be a decent option to run indoors on a treadmill, and they're stable enough for a couple of home workouts. 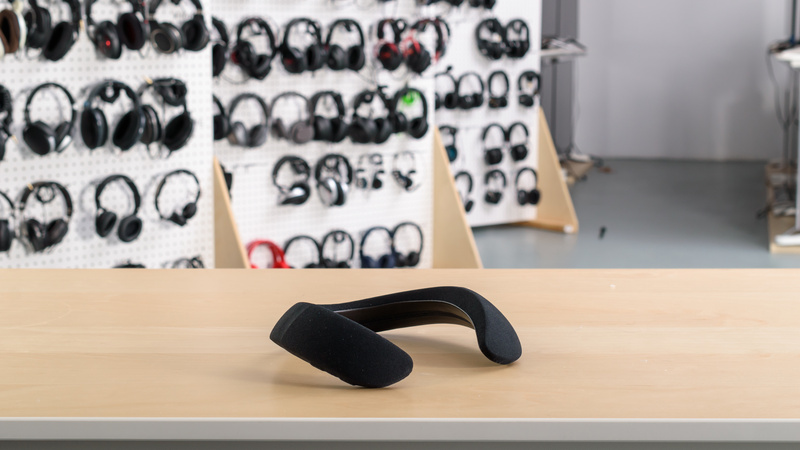 Unfortunately, since their sound is strongly dependent on the position of your head with respect to the speakers, this means that as they move and bounce around on your neck, the sound quality will shift and may be a bit frustrating if you're trying to focus. It's a bit less noticeable on podcasts and audiobooks, but the effect is still there. Also, although you can tighten the neckband, they will not be stable enough for exercises that require a lot of tilting or laying on your back like crunches, and some yoga poses. 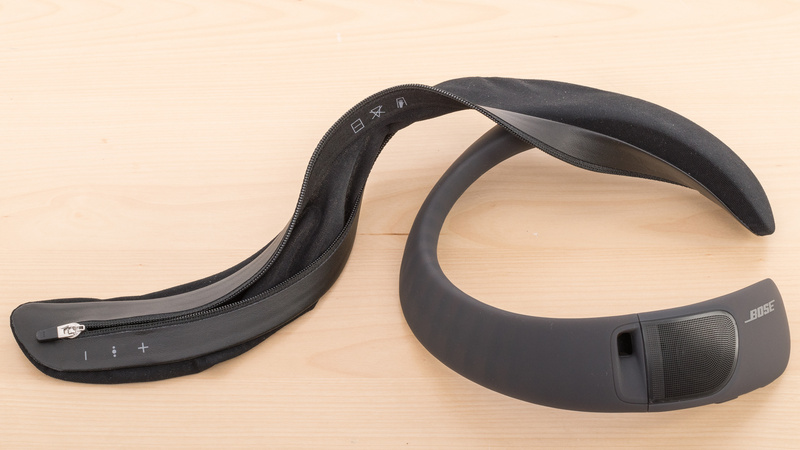 The Bose SoundWear Companion speaker are mediocre sounding wearables. The bass is almost entirely tactile with a decent amount of punch that is felt through the body. However, it lacks quite a bit of sub-bass thump and rumble. They also have an uneven and recessed mid-range which weakens vocals and lead instruments, but their treble is quite well-balanced which is important for reproducing clear and present vocals. Overall, their bass is not as deep as most headphones, but it is tactile, which is good. Their soundstage is out-of-head and larger than most headphones, but it isn't very natural or speaker-like. So they are suitable for listening to podcasts, audiobooks, or music that is not very bass-heavy, but they won't be ideal for fans of extended and heavy bass. The bass of the Bose SoundWear is lacking. These wearable speakers don't produce much bass through sound pressure, which is why they have such a low score in our measurements. However, they do transmit a decent amount of tactile bass through the body, but even their tactile bass isn't very extended. So overall they do produce a decent amount of punch on the kick drums, but won't produce any thump or rumble in the sub-bass range. We have plans for measuring the tactile bass of headphones/speakers in the future in order to assess the bass of wearable speakers better. The mid-range is below-average. The response is uneven, and not very balanced. Low-mid is lacking around 300Hz, which thins out the vocals a little bit. Mid-mid is decently balanced, but high-mid is quite uneven and recessed. This negatively affects the intensity and projection of vocals and lead instruments. The treble range performance is very good. The overall response is a bit uneven but well-balanced. Low-treble is overemphasized by less than 2dB. This adds a bit of excess brightness to the overall sound. The dip around 7.5KHz has a small negative effect on the production of sibilances (S and Ts). This will be mostly noticeably on vocals and cymbals. The frequency response consistency of the SoundWear is above-average. Due to the design of these speakers, the user doesn't need to worry about achieving an air-tight seal in order to get a consistent bass delivery. However, since these speakers transmit a big portion of their bass through the body, it is important not have very thick clothes between the speaker and your shoulders as it will negatively effect the tactile sensation of their bass. The treble range is also quite consistent and only affected by different neck lengths and body shapes. The slight variations in bass delivery in our measurements is also due to the different neck lengths and body shapes of our human subjects. The Bose SoundWear have an above-average imaging. Weighted group delay is at 5.15 which is quite high. The GD graph shows that the high group delay only happens in the bass range, where the speakers don't produce much sound pressure. Most of the bass is tactile and transmitted through the body. So the actual experience of their bass isn't too bad. Additionally, the L/R drivers of our test unit were decently matched in frequency and amplitude, but showed a big mismatch in phase response. This seems to be intentional and is Bose's way of creating a wide stereo image by creating phase shifts in the treble range. The soundstage is above-average. Due to the fact that the speakers are positioned on the shoulders rather than the ears, they get near perfect scores for openness and acoustic space excitation. 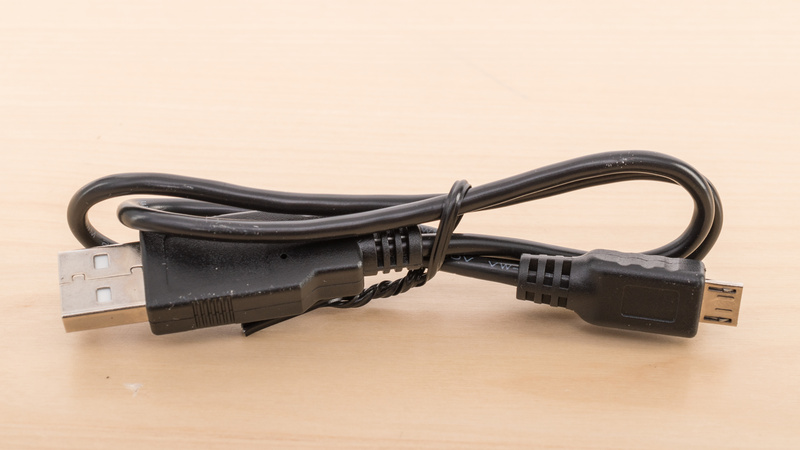 Also, it seems that the Bose has a cross-feed circuit which is always enabled, meaning some of the L channel signal comes through the R channel and vice versa. This replicates the crosstalk that occurs in an actual stereo speaker setup. 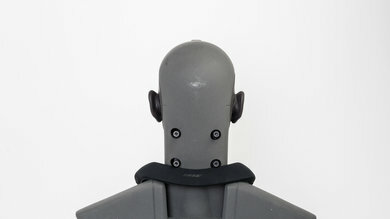 However, they didn't perform very good in the PRTF tests, probably due to them being position below the ears, as opposed to in-front. 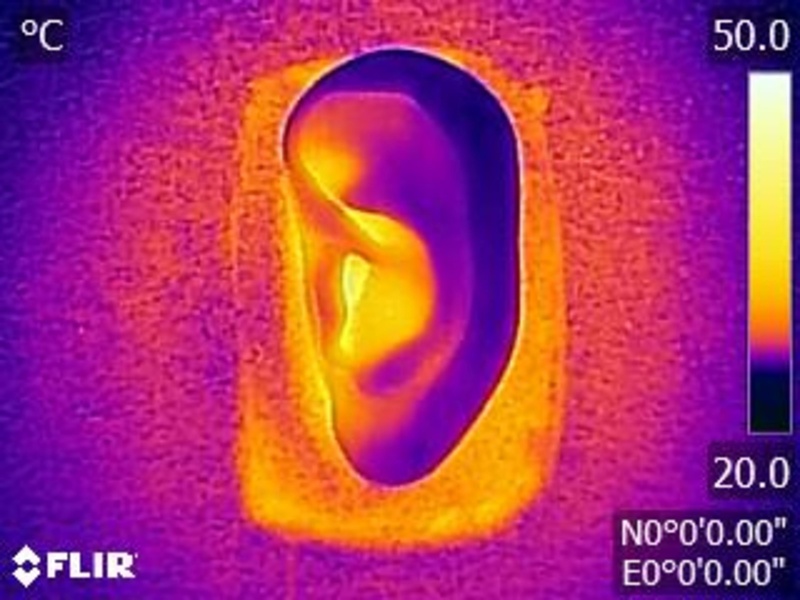 They show very little pinna interaction/activation, but a decent 10KHz notch. Overall the soundstage is open, immersive and out-of-head, but doesn't feel very large, natural or speaker-like. The harmonic distortion performance is sub-par. The overall amount of harmonic distortion produced is elevated, especially around 1.5KHz and 6KHz. This can make the sound of these regions a bit impure and harsh. We also noticed that there is significant dynamic range compression present, even at 90dB SPL, especially in the bass range. This could result in pumping and compression artifacts. 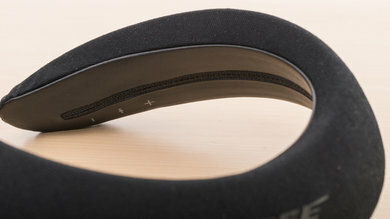 The Bose SoundWear have a neckband speaker design that does not have ear cups or buds that cover or enter the ear. This means they provide no isolation from ambient noise, by design, and everyone in your immediate vicinity will be able to hear what you're listening to. They are best used indoors at home or in private at the office where the leakage level will not be too distracting to the people around you and conditions are quiet enough that you can clearly hear the speakers and aren't bothered by the ambient noise. The isolation performance is poor. 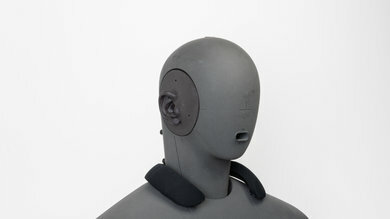 Due to their wearable design and lack of active noise cancelling, it is normal for them to provide no isolation since they don't cover the ears at all. However, this can be considered a desirable feature if you want to be fully aware of your surroundings. The leakage performance of the Bose SoundWear is bad. 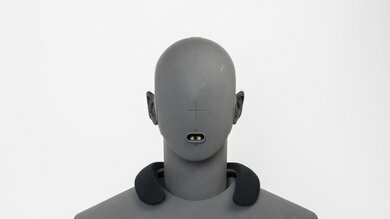 This wearable speaker is not advertised to a have low leakage, so it was expected that they would perform more like portable speakers than headphones. The significant portion of their leakage is spread between 40Hz and 20KHz, which is the broadest we have measured so far. The overall level of the leakage is also the loudest we have measured. With the music at 100dB SPL, the leakage at 1 foot away averages at 89dB SPL and peaks at 98dB SPL. The microphone of the Bose SoundWear has an average quality. In quiet environments, speech recorded or transmitted with this mic will sound relatively thin, muffled, and lacking in detail. However, it'll still be decently comprehensible. In noisy situations, it is able to separate speech from background noise in a moderately loud environment, like a busy street. The recording quality is mediocre. The LFE (low-frequency extension) of 364Hz means that speech recorded/transmitted with this mic will sound relatively thin. The HFE (high-frequency extension) is at 3KHz, which results in a speech that lacks detail and sounds muffled. However, the response between the LFE and HFE points is flat, which is good. The microphone of the Bose SoundWear is decent at noise handling. It achieved a speech-to-noise ratio of 20dB in our SpNR test, indicating that it is able to separate speech from ambient noise to a good degree in moderately loud environments. This is partially due to the proximity of the microphone to the mouth since the SoundWear sits on the shoulders. The Bose SoundWear have a decent 12hr battery life but a barebones and limited app. They should easily last you the whole day if you take occasional breaks during your listening session and they have a great and adjustable auto-off timer that will automatically shut the speakers down when inactive to conserve power. Unfortunately, their app is bland and lackluster. It looks good but does not provide as many features like the and EQ, or mic options. The Bose SoundWear have a decent battery life of about 12.1 hours. This means you won't have to charge them as often throughout the day. They also have an adjustable timer that helps prolong the battery life. Unfortunately, you can't use them while they're charging and they also take a quite bit of time to charge at 2.7 hours. The Bose Connect app looks fancy but doesn't have a lot of features. It only allows you to connect, rename, and update your SoundWear but doesn't provide you with an equalizer or any other sound enhancing features. On the upside, you get the battery level status, an auto-off timer you can set at different intervals and an in-app player that gives you some playback control but that's pretty much it. The Bose SoundWear are a Bluetooth-only companion speaker that do not come with a 1/8" TRRS audio cable or a base/dock. They have a good wireless range and can connect simultaneously to two devices which allows you to quickly and easily switch between your Bluetooth sources like your phone and PC. Unfortunately, like most Bluetooth audio devices, they have a bit too much wireless latency to be a suitable option for watching movies and gaming. The Bose Soundwear Companion, like most bose wireless devices, can be paired with two devices simultaneously so you can easily switch between your phone and PC/tablet. Unfortunately, they do not have NFC pairing. The SoundWear are Bluetooth only companion speakers that do not come with a regular audio cable. 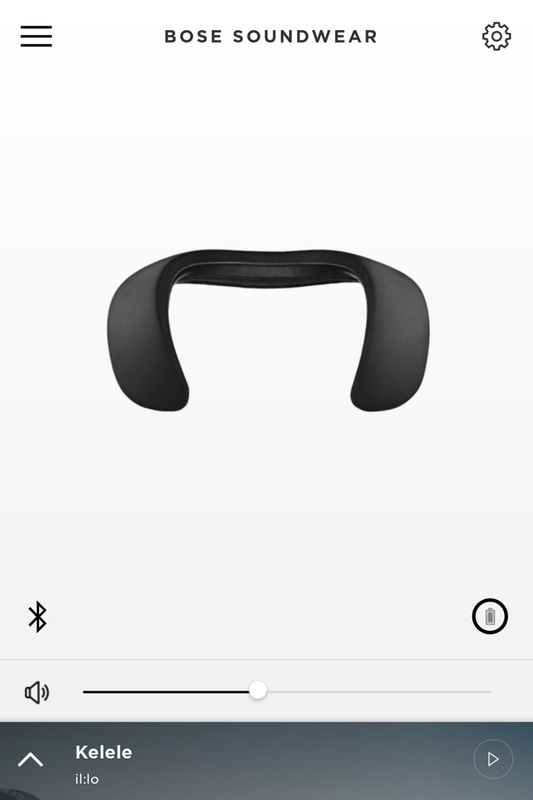 The Bose SoundWear Companion do not have a dock. If you need a headset with a dock that also has a wired connection for gaming or watching movies, then consider the SteelSeries Arctis 7. The Bose Soundwear Companion have a good wireless range. They reached up to 43ft when the Bluetooth source was obstructed and in another room. They also do quite well in direct-line-of-sight reaching up to 141 ft. They should have enough range to casually walk around your home or office when paired to a fixed Bluetooth source like your PC or TV and will rarely have any connection drops if you're using your phone and it's in your pocket. They have a bit too much latency to be the best option for watching TV or gaming. Also, since they are Bluetooth only headphones with no low latency codecs they won't be the ideal choice for a home theater set up. The Bose SoundWear are in their own class of personal listening device, so they are not really comparable to any of the headphones we've tested so far. They do not cover your ears so they have excellent breathability and great comfort. They also have a wide, spacious but unnatural soundstage since they are basically speakers you wear around your neck that do not block any noise. Unfortunately, this also means they will not be versatile enough to use outdoors and their sound quality isn't quite as good as a real speaker setup or headphones close to your ears that are able to reproduce bass a little better. They're a niche device that won't be for everyone but will be exactly what some listeners are looking for, especially if you work from home. Sub-par for mixed usage. 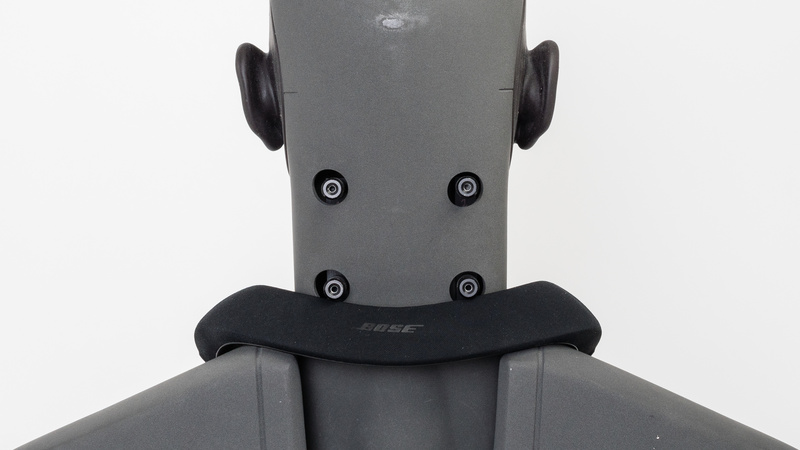 The Bose SoundWear have a very niche design and appeal. They are a personal listening device but provide no isolation of room ambient noise and leak a lot since they are pretty much speakers. This makes them a decent choice to use at home or in an isolated office since their breathability and comfort is very high. They also have a decently balanced sound although they may lack a bit of bass. Unfortunately for everything else they are poorly suited and would not be ideal to use outdoors since you will most likely distract everyone around you and won't be able to focus on your music and or podcast. Average-at-best for critical listening. The SoundWear have a unique soundstage since they are basically speakers that you wear around your neck. This gives them a good ambiance that some critical listeners may like, however, their sound quality is not the most balanced. They have a decent representation of instruments and vocals, and they do not sound too sharp on already bright tracks. Unfortunately, they do not pack a lot of bass but it is tactile so you do feel it in your body. The speakers sit relatively far from your ears, especially when compared to headphones, and since they do not create a seal with ear cups or an in-ear/earbud fit, they have a difficult time producing a lot of bass. Moving the neckband closer to your ears somewhat mitigates this issue, but it's not a practical fix and will not be ideal for everyone. If you listen to a lot of bass-heavy tracks then they won't be the ideal choice but for podcasts, audiobooks and vocal/instrument heavy songs, they should be good enough for most. Not suitable for commuting. They provide no isolation from ambient noise and they leak loud enough to be distracting to everyone around you even on a busy bus. Average for sports. They have excellent breathability since they do not cover your ears. They're comfortable and have an easy to use control scheme. Unfortunately, they are not the most stable option for more demanding exercises as they move and bounce around a lot and may fall off your neck if you workouts involve a lot of tilting and laying on your back. On the upside, they should be stable enough to jog and would be a decent option to use on your treadmill at home. Sub-par for office use. Unless you work alone or in an isolated office, the leakage level will be too bothersome for those around you. Also, since they do not block any noise, you will hear all the ambient sounds in your environment fairly easily, even when listening to music at higher-than-average volumes. Below-average for home theater. The Bose SoundWear are Bluetooth only companion speakers that have a bit too much latency to be suitable for watching a lot of video content. Also since they are speakers that leak quite a lot, it may be simpler to just watch your TV with the volume on. Sub-par for gaming. The Bose SoundWear have a bit too much latency for gaming and since they are Bluetooth-only speaker that will not work with your consoles. They also do not come with a cable to reduce latency. They're leaky and provide no isolation so they won't be the best option for most gaming environments unless you game alone.